KENYA has one of the most diverse and colorful collections of tribal people anywhere in Africa. It has also been recognized as the ‘cradle of humanity.’ Kenya boasts some of the best-stocked, and most accessible wildlife parks in Africa, great coral reefs and palm-fringed white-sand beaches along the Indian Ocean. Witnessing the spectacular annual wildebeest migration at Masaai Mara National Reserve is a treat, but difficult to time right, as is driving around Amboseli National Park. The park has as its backdrop the stunning Mt Kilimanjaro. The 16th-century Fort Jesus and the Old Town in Mombasa are a delight, or perhaps you would be keen to trek to revered Mt Kenya, Africa’s second-highest mountain. MASAAI MARA NATIONAL RESERVE — This is the Kenyan section of the wildly beautiful Serengeti Plains, and the wildlife is abundant. 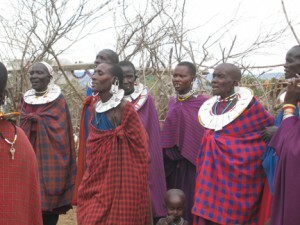 Traditionally these are the lands of the Masaai, but the people have been displaced in favor of the animals. The Mara is a 320-sq-km area of open rolling grassland, dotted with the distinctive flat-topped acacia trees, tucked away in the southwest corner of the reserve. The highlight of the Mara is without a doubt the annual wildebeest migration. Literally millions of wildebeest stray north from the Serengeti in July and August in search of lush grass, before turning south again from Masaai Mara in about October. Should you be in the reserve at this time, you will experience the ultimate in wildlife viewing. AMBOSELI NATIONAL PARK — The most popular park after Masai Mara because of the spectacular backdrop: Mt Kilimanjaro, and because it is fairly close to Nairobi. Amboseli does have lion, hippo, cheeta and zebra, as well as huge herds of buffalo and elephant. The bird life, too, is amazing in Amboseli and they are attracted to the park because of the permanent swamps. MT KENYA NATIONAL PARK — Mt Kenya is Africa’s second-highest mountain. The snow-covered peaks can be seen from miles away until the late-morning clouds obscure the view. There are 3 main climbing routes. The most popular is Naro Moru; the least used is the Sirimon Route, and Chogoria is the most beautiful. TSAVO NATIONAL PARK — Tsavo, the largest park in Kenya, has been split for administrative purposes into Tsavo West and Tsavo East National Parks. Tsavo West is the more popular and the easier to access. 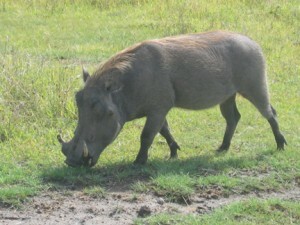 MERU NATIONAL PARK — To the east of Samburu and Buffalo Springs lie the Nyambeni Hills, and beyond is Meru National Park. Covering some 1,810 square kilometers (700 mls) the park was made famous by the book, Born Free, which detailed author Joy Adamson’s hand rearing of orphaned lioness Elsa in the park, and features wonderful scenic diversity. SAMBURU & SURROUNDS — The Samburu/Buffalo Springs and Shaba National Reserves are small but scenic reserves ranging in altitude from 800 to 1230 metres/263 to 404 feet, and have the Ewaso Nyiro River in common. It is the unique wildlife, including the gerenuk, a tall thin gazelle-like antelope, also Grevy’s zebra, beisa oryx and reticulated giraffe, which attracts many visitors to this area. ABERDARE NATIONAL PARK — Aberdare National Park is a small park (767 square kilometers/296 sq mls) situated 100 kilometres/62 miles north of Nairobi. Aberdare boasts the Nyandarua Mountain range and the thickly forested hills and valleys, which are home to rhino, bongo antelope and black and white colobus monkeys. GREAT RIFT VALLEY — The central portion of the Great Rift Valley is raised, with the Aberdare Mountains and Mt Kenya to the east, and Mau Escarpment and Cherangani Hills in the west. The northern and southernmost sectors of the Rift are low-lying, arid and rugged, with spectacular volcanic landforms. KENYAN COAST — The Kenyan coastline is a place with a long and exotic history; its calm blue waters were the traditional passage of the Arabian Spice Trade. Along the length of this coast, Arab and Portuguese forts, old towns and the overgrown, deserted ruins of Swahili outposts are witness to the fascinating history of Kenya. MOMBASA — Is the largest port on the coast of East Africa. Most of the town sprawls over Mombasa Island, connected to the mainland by a causeway. The city has retained its traditional character and the Old Town is much the same as it was in the mid 19th century. There are some wonderful beaches fairly close to Mombasa. Kenya has been a major migratory pathway for millennia. The first wave of immigrants was the tall nomadic Cushitic-speaking people from Ethiopia. 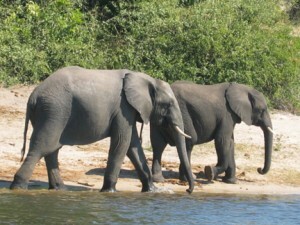 They began to move south and reached as far as central Tanzania. The second group of pastoralists, the Eastern Cushitics, occupied much of central Kenya. The rest of the ancestors of Kenya’s array of tribes arrived from all over Africa. Kenya gained independence from the British in 1963. The Kenya African National Union became the ruling party, and under the presidency of Jomo Kenyatta, Kenya developed into one of Africa’s most stable and prosperous nations. CLIMATE — Kenya is on the equator and can be divided into roughly four primary zones: the hot and humid coastal belt; the Rift Valley and central highlands, which are very scenic with lots of lakes and mountains; western Kenya, home to the Masaai Mara National Reserve; and the semiarid bushland of the north and east of the country. The long rains fall March to May and the short rains October to November. In Kenya each season has its own distinct advantages, and each area has its best moments. The annual wildebeest migration is an incredible event only witnessed in East Africa. The equator, the geography, the time of year and the Indian Ocean trade winds are all factors that influence the weather in Kenya and Tanzania and should be taken into account if you are planning any type of African safari travel. Hot Days and Cooler Evenings on Safari – As a general rule of thumb, on safari you should expect hot days and cooler evenings. No matter what time of year you are traveling, we always recommend that you travel with at least a warm sweater and a light rain jacket. Tropical Weather on the Coast – Traveling to Zanzibar and Kenya coastal areas you can expect the weather to be humid and tropical with occasional light breezes. December to March – This is summer in East Africa and temperatures are warm. The short rains from early November to late March are sporadic and don’t last long. 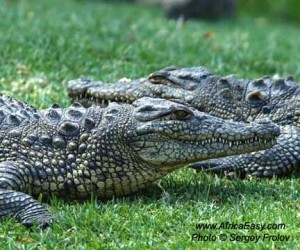 Game viewing in the Serengeti and diving in Zanzibar are excellent now. April to June – The long rains are from early April through early June-but don’t be put off: safaris are still good in the Serengeti, Lake Manyara and the Masai Mara. It is also less expensive and less crowded for travelers during this season, which makes it one of the best times to go. July to November – This season offers comfortable temperatures and is a popular time for travel because of summer holidays in the Northern Hemisphere. It can get very busy, so do be sure to book well in advance. If you want to climb Kilimanjaro, now is the time to do it. SIZE — Kenya is 583,000 sq km with a population of approximately 30 million people. THE PEOPLE — Kenya is made up mostly Africans, with small groups of Asians, Arabs and Europeans. There are more than 70 tribal groups among the Africans. The large majority of Kenyans, outside of the coastal and eastern provinces, are Christians. Most of those living on the coast and in the eastern part of the country are Muslim. THE MAASAI — The Masaai first came to the region from Sudan and dominated large areas of central Kenya, until the people and their cattle were decimated by famine and disease in the late 19th century. More than any other people today, the Masaai have become a symbol of ‘tribal’ Kenya. LANGUAGE — The official languages are Swahili and English.